Lisa and Jamie enjoyed their reception at St. Joseph's Catholic Church Hall in Marksville. The guests entered into the hall which was lit with candles and luminaries. 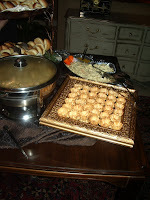 Everyone loved the food and boy, did they eat alot! 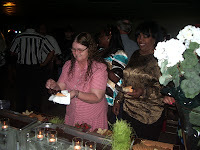 We met alot of new folks and saw some that attended other events catered by us. Late in the evening we opened the "Chocolate River"....wow....they loved it! 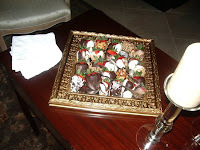 If you were at Lisa and Jamie's reception and got chocolate on your dress........remember to Shout it out! The faculty and staff of Marksville High had a wonderful end of school closing luncheon. Barbecue was the meal of choice and was enjoyed by all. 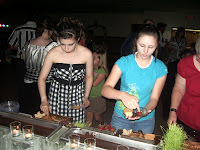 The desserts were also popular! 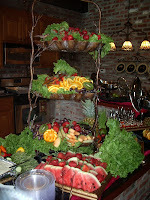 What a busy week for Best Catered Events. We are everywhere from dawn til midnite this week. Wednesday night was a graduation party for Bunkie High. All 200 in attendance ate and partied and had a wonderful celebration! 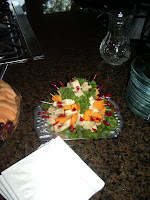 Fun, party food was on the menu tonight. Drummettes, Meatballs, Chicken Pasta, Finger Sandwiches, Fruit, Layered Bean Dips, and cake. 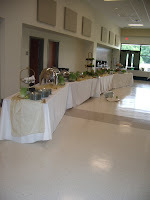 Thursday night we catered a party for Marksville High School's Graduation! 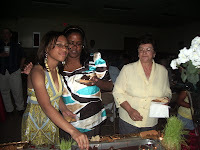 Again, food and fun were the menu. Friday we will cater lunch for LaFargue Elementary staff and also Marksville High School teachers closing of school luncheon. Barbecue theme for Marksville High featuring barbecue chicken, smoked beef brisket, pork loin, smoked sausage links, green salad, cheesey potatoes, baked beans, garlic bread, corn on the cob, and peaches and cream and strawberry delight for dessert! Whew, they are going to have a feast! 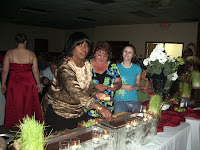 Friday night continues the marathon with the rehearsal dinner for Lisa Dupont and Jamie Gaspard. 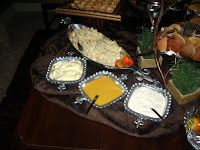 Light dinner selections were chosen by Mrs. Gaspard for the occasion. 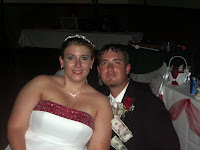 Saturday will once again bring us into Marksville for Lisa and Jamie's reception. Her colors are candy apple red and white. I have big plans for her food table. She has had my services booked for over a year now! 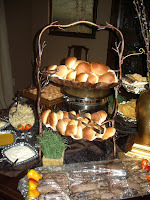 Sunday will put us on the road to Simmsport to cater Hollie Rabalais shower at the church. We will be using raspberry and lemon yellow as the colors and wheat grass everywhere. Hollie is definitely one of my favorite brides. She also booked me for her reception over a year ago! Germaine dropped by today in all the lunch madness to update her menu for her August reception. She is getting so excited to marry BJ Gaspard and I am looking forward to working with her to make the reception one with a "Camouflage Theme". 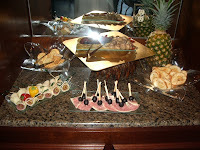 Best Catered Events, We don't just bring food. We Deliver Events! Our motto and what we do! Family and friends of Joe Allen enjoyed an afternoon of food and fun at St. Rita's Catholic Church in Alexandria, LA on Sunday, May 10, 2009. The menu was so fun! 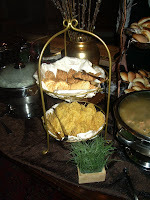 The kids table had an attendant making mac and cheese "tinis", chicken tenders, and mini pepperoni pizzas. The adults enjoyed a salad of Mezlean Greens, Red Onion, Wild Mushrooms, Toasted Walnuts, Asparagus and a honey balsamic vinagrette. 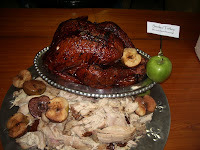 The feast also included Chicken Cordon Bleu, Smoked Beef Brisket, Whole Apple Pecan Wood Smoked Turkeys, Mini Crawfish Pies, Shrimp Martinis, Grilled Fresh Garden Vegetables, New Potatoes, ham and asparagus roll ups, fresh fruit and crudite cups. Dessert came out later.........Chocolate Fondue with Louisiana strawberries, bananas, marshmallow treats, pretzel rods and green apple wedges. What a fun celebration with clowns, face painting, and even a magician! Tara picked a lovely setting for her reception. The home of Candi and Jody Chenevert in Plaucheville was decorated lovely for the occasion. 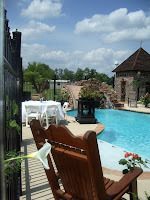 Tables with floor length linens and fresh flowers adorned the courtyard, patio and pool area. 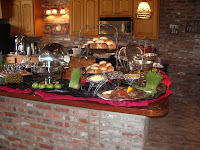 We set up the buffet inside the pool house on a wonderful wooden bar. 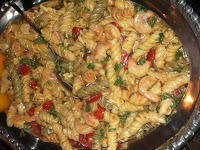 The guests raved over the food and complimented the presentation the entire afternoon. 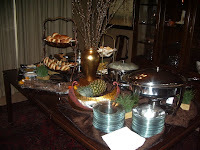 Best Catered Events started our lunch delivery division on Monday, April 6, 2009. We deliver sandwiches, salads, wraps and daily hot lunches Monday-Thursday to Marksville business locations. The response has been tremendous! Our "Free Lunch Friday" promotion for April ended on April 29, and the winners had lunch for their office delivered on Friday, May 1st. 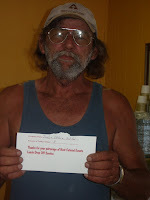 Billy Hariford, a local self employed carpenter and frequent customer of Best Catered Events drew the winning entry. The Third Floor of the Avoyelles Parish Court House won this month. Congratulations and enjoy your lunch from Best Catered Events! On Saturday-April 25, 2009 friends and graduates of Bunkie High School enjoyed a reunion gathering at the home of Dr. Don Fletcher and his wife Anita. The event was organized by Mrs. Mary Charlotte Shannon of Morgan City, LA. 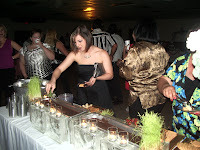 Everyone enjoyed the food and bar, but their memories were the highlight of the evening. A good time was enjoyed by all. 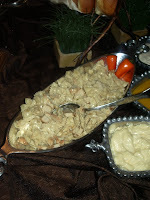 Here are a few pictures of the food that was ordered for the event. Evans Kade is getting big! Evans and momo enjoyed a quick visit on Saturday-May 2, 2009. 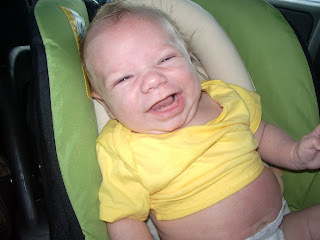 Momo had him smiling in no time! He is so cute and growing so fast! !